Char and I had a little fun with April Fools’ Day last year. I scared my daughter Nola by hiding in a tent the kids had put up in the dining room a few days prior. By then it was invisible. I sat in it for about twenty minutes while she ate breakfast and let her guard down. Then boom! All of sudden she was inches away from a lion trapped in her tent, clawing to get out. We also ran with the upside-down cup of water gag. Here’s the video. Basically last year was an introduction to April Fools for my girls. I think they got it. This year it snuck up on me. I was not ready at all. My girls were though. I had a quick film shoot the morning of April 1st, about an hour away in Lincoln. After it was over I headed home around 11 a.m. I called Charity to let her know I was en route when my daughter Nola (7) answered. She proceeded to tell me that they were all at Scheels, a sporting goods store that boasts an indoor ferris wheel that my kids are fond of. I said I didn’t believe her and to put the ferris wheel operator on the phone to corroborate her story. Nola “handed” the phone over. I chatted with the Scheels employee for a bit, who knew very little about sporting goods and whose voice sounded suspiciously like Nola’s in a nasally high pitch. Once I concluded that they were indeed at Scheels I wished them a good time, told them to dedicate one of their ferris wheel revolutions to me, and then hung up. 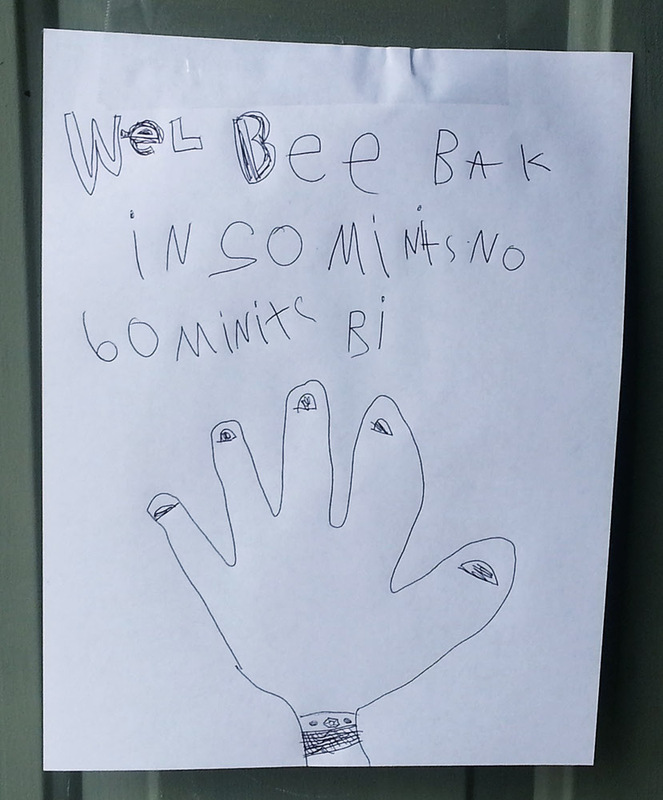 Upon arriving at home I found this note taped to the front door. She must write her thoughts in real-time. “Aaaaaaah, you totally got me,” said the good dad who wanted to give his seven and five-year-old a win. The rest of the day was a game for them called, “How many April Fools Pranks Can We Fit In Before We Go To Bed.” These turned out to all be quick one-liners. They were having fun with it. But somehow April Fools’ Day, in their minds, got magnified to the status of a major holiday. At one point I found Nola crying on our bed. I sat down and asked her what was wrong and she said that everyone was crying. Sure enough a chorus of wailing lamentations rose from yonder and echoed through our halls. I think it was one of those unfortunate instances, that usually occur when your whole family is tired. When overwhelming issues stack up on everyone all at the same time. Minus me of course. I’m the rock. Any other day and it probably wouldn’t have mattered. But in her mind it was like our family was soiling Christmas with their tears. She didn’t care what they were crying about, just that the memory of All Fools’ Day 2016 would forever be tarnished by unchecked emotions. Like in a moment of existential clarity she realized that she has only 80 to 90 April Fools’ Days in her life, and her basket case of a family was bringing one of them down. At another point in the day Nola asked if she had to do schoolwork. The argument against being, “Because it’s April Fools’ Day.” She thinks that no one should have to work on a day that should be spent with family—pranking the crap out of each other. I don’t necessarily disagree. We’re not sure how this day got put on such a high pedestal. But it’s there. Now that I know this I’ll try to put more thought into next year. Besides Remy will be almost two-years-old then. It’s kind of hard to prank babies at this point. Giving them a bottle of watered down mayonnaise or putting itching powder in their diaper, only makes you look like a giant jerk who probably shouldn’t have kids. Not that a two-year-old’s understanding of pranks is a whole lot better, but we’re getting closer. I’m looking forward to next year’s newly minted major holiday for the Long household. Does anyone else prank their kids on April Fools’ Day? Or randomly throughout the year? Comment below and tell me your best pranks. I have a whole year to prepare, but just like Christmas, it’ll sneak up on ya. Charity was probably crying because she realized Nola thought it was a major holiday and you guys hadn’t properly prepared this year. It’s like me and the Tooth Fairy. I really hate that fairy – LATE.EVERY.TIME. At lunch the other day a couple of moms where telling their pranks. Like freezing the bowl of cereal with spoon in it the night before, I liked that one.